There are some superb benefits to be found through having regular massage therapy treatments. 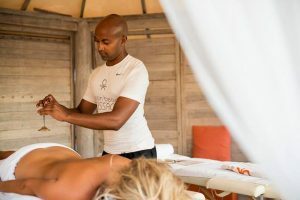 Especially from one of our Professional Massage Therapists here at O Beach Ibiza. Whether your need is to have a moment of relaxation, reduce muscle tension or attain relief from chronic pain, a therapeutic massage is the way forward! 1 – Your on Holiday! If ever there was a better time to get a massage, then it would have to be whilst on holiday. It’s the time where there’s absolutely no reason to have any worries whether that’s work, family, bills etc. It’s the time to focus on you! So remember holidays are to relax, breakaway, enjoy & have fun. Whether you’re an athlete, mum, student or just work in office, you will have come across some sort of pain. We have all had those days when simply reaching down to lace up a pair of trainers is an issue too painful to complete. An athletic injury, sleeping in the wrong position, or lifting a heavy box can all cause chaos on your muscles and stop you dead in your tracks for days. Thankfully, a course of regular massage treatments can help relieve this muscle pain, tension, and soreness. Most common are tight shoulders, neck, lower back and legs. Besides supporting good physical health, massage can also improve your emotional and mental well-being. Psychological health issues like anxiety and depression can be related to elevated cortisol levels. Many different studies indicate massage helps combat these issues because it can reduce levels of cortisol while increasing neurotransmitters that combat depression. Psychological problems are often apparent in physical ways. Think about it, what does your body do when your feeling down and low? Most likely it feels achy and weak, your shoulders droop, you drag your feet and you slump over. Massage therapists call this a “structural collapse” which happens when we feel depressed. Most likely, 80% of holiday makers will have at least one day where you will have drank a few too many strawberry daiquiris, vodkas or shots, and you are not feeling the will to go on! In essence the massage is a fantastic way to come back to a quick recovery, with boosting your immune system. The “O Beach Detox Massage” is specifically designed by Celebrity Masseur Ashley Fernando. The treatment is compiled with lots of techniques, but incorporates Lymphatic Drainage, Lomi Lomi Style Massage with Facial and Cranial Pressure Points. 5 – Massage can make you look younger! Forget Botox! Why stick needles in your head when a much more simple and natural facial massage can make you look younger, healthier and more beautiful. Massaging relaxes your facial muscles, which softens your expression, including those unattractive lines we can get from scowling and squinting. Makeup artist Gucci Westman told the Wall Street Journal that she often gives fashion models facial massages before they walk down the runway. Since massage improves circulation throughout your largest organ – your skin! – it can also give you a more radiant appearance. Simply put – good blood flow gives you that special glow. Any one who has had a massage can confirm that you feel like a new person afterwards. In addition to all the health benefits listed above Massage Therapy boosts endorphins, the same hormone associated with a runners high. If you have never had a professional massage, now is the time to try!